Jeryn Shortt has been known as one of the better pitchers in the area for a while now. On Saturday with his family in attendance and Baseball Ontario celebrating its 100th anniversary, the 11-year-old fireballer was crowned the best young arm in the province. Shortt – a member of the Simcoe mosquito Giants in 2017 – was named the Fergie Jenkins Pitcher of the Year for the peewee and under age group at a gala event in Hamilton. It was the first time Simcoe Minor Baseball has secured a finalist position for any individual provincial award since Scott MacDonald was named Coach of the Year in 2004. As coach of the mosquito Giants, vice president of Simcoe Minor Baseball and someone that's dedicated countless hours to the growth of the game within Norfolk, Shortt's father was just as overwhelmed by the announcement. A Grade 6 student at West Lynn Public School, Shortt threw 60.2 innings for the Giants recording a 2.19 ERA, 1.533 WHIP and just 23 walks to go along with those aforementioned 87 strikeouts. His strike rate was a stellar 67.5 percent, almost unheard of at the mosquito level. Shortt also plays a strong shortstop when he's not on the mound, and he hit over .500 at the plate this season between tournaments and within the InterCounty Baseball Association, which includes centres like Kitchener, Brantford, and Cambridge. He won a 'player of the game' award at three different tournaments and was part of Simcoe's Baseball Ontario mosquito 'B' title in 2016. The young hurler enjoys the mental chess match between pitcher and hitter as much as anything the sport provides. Shortt's win isn't just one for his family and friends but the entire SMBA. The executive and coaching staff have been diligent in offering pitching clinics and off-season training in recent years and Shortt's award is just one of the many payoffs they've seen. Finalists for Baseball Ontario Awards are based on in-depth nominations and since Moulton has been at the helm, SMBA has made submissions part of its MO. Jeff Shortt said the best part of the night was watching a Simcoe player get honoured amongst the many big city nominees. For young Jeryn, it's knowing he's on the right track to accomplishing the ultimate goal. SIMCOE - A group of mosquito ballplayers is making Simcoe's Lions Park a very uncomfortable spot for visitors. 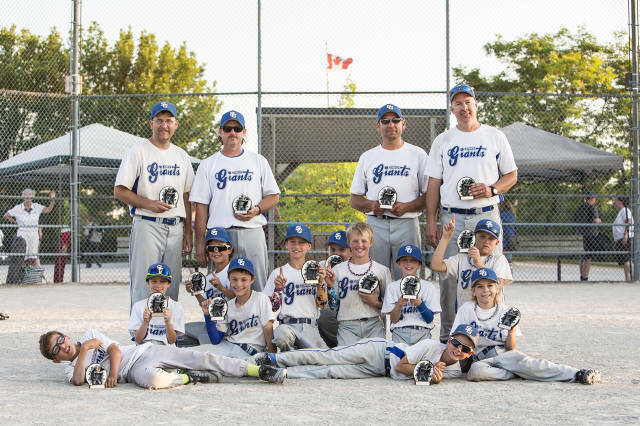 Just as they did 12 months ago, the Simcoe major mosquito Giants won their home tournament (A and under) this past weekend by going a perfect 6-0. Competing in the 12-team division, Simcoe outscored opponents a whopping 80-11. The Giants made it through the round robin with relative ease and got a nice challenge from Bolton (9-6) in the quarter-final but then trounced Oshawa (17-2) and Ingersoll (6-1) for gold. 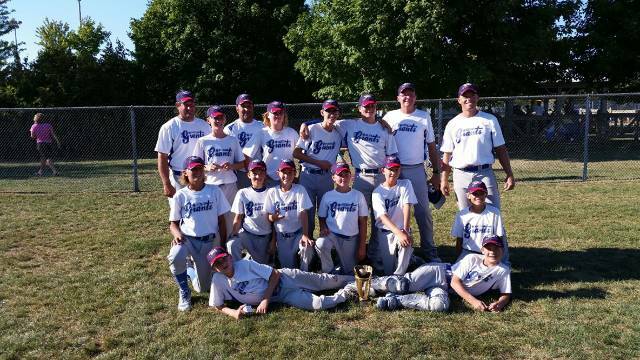 Following their Ontario Baseball Association victory at the 'B' level in 2016, Simcoe is moving up to the 'A' tournament in Niagara Falls this coming Labour Day. Shortt is looking forward to seeing how his team rises to a new challenge in the search for back-to-back provincial crowns. Speaking of being in good shape, the Simcoe minor mosquitoes also held a 12-team 'A and under' tournament at Lions Park where they finished as one of the best of the bunch. Despite being shorthanded Simcoe went unbeaten in the round robin and edged Waterloo in the quarters before being eliminated by Kitchener in the semis. Winnie's team will now set their sights on the Southern Counties tournament taking place in Delhi in mid-August before the OBA 'B' gathering in Cobourg on Labour Day weekend. Shortt pointed out the combined tournament was the largest ever hosted by Simcoe Minor Baseball, one that was well received by out of town visitors. SIMCOE - Just when you think you've seen it all on a baseball diamond the game comes up with something new. The play that crowned the Simcoe Giants champions of this past weekend's Bolton Major Midget Tournament falls into that category. In the bottom of the seventh (and final) inning Simcoe was clinging to a one run lead against the hosts. Bolton had runners on first and second when their batter smacked a line drive to right field. The baserunner on second tried to score and tie the contest but Carter May's throw came home in plenty of time with a jumping snag and tag applied by catcher Brian MacCormack. The runner on first had advanced to second during that time and then decided to get aggressive and try for third. MacCormack alertly gunned him down to give Simcoe a 5-4 win and tournament title. “It's honest to God the first time I've ever seen a double play like that to end the game, it was crazy,” said Steve Wall, a member of the Giants coaching staff. That play wasn't the only memorable moment from the weekend. Simcoe actually dropped their opening contest to Bolton by a score of 9-3 but rebounded to beat Newmarket I 4-2, Newmarket II 19-0 and Peterborough 13-5. The turning point may well have come during the 19-0 mercy victory. Wall noted that some players that have struggled to produce offence broke out in a big way. Simcoe didn't make things easy on themselves after getting down 3-0 early in the championship contest. Despite another rocky start, they managed to take the lead in the fifth. The win comes at a perfect time as the Giants are just weeks away from hosting the Ontario Baseball Association 'B' championship tournament at Memorial Park Aug. 25-27. The victory, they hope, will equal more success during InterCounty Baseball Association Tier I league play. “That was the first thing the guys talked about – now maybe we can get better results in the league by being more consistent,” Wall said. Game MVPs were collected by Cole Robinson, Ty Wall, Carter May and Joel Coderre twice (both the semifinal and final). The Simcoe minor peewee Giants didn't just beat opponents last weekend, they pounded them into submission. Hosting 10 teams as part of the Simcoe Minor Baseball Association 'A and under' event at Lions Park, head coach Chad Leman's team registered six straight wins. More than that, each one of those victories came by way of a mercy, including an 18-8 triumph over Chatham in the final. “Six straight mercies in a tournament is a pretty great accomplishment and they should be proud of that,” Leman said. Their regular season is played under the Inter County Baseball Association's Tier I division, which includes major centres like Kitchener, Guelph, and Cambridge. As of Tuesday Simcoe sat with a mark of 3 wins and 12 losses but one of those victories (over third-seeded Guelph) came following their tournament win. Leman said the entire coaching staff has noticed a change in the group since their weekend triumph. “You can tell that there's a little bit more of a confidence in the boys that's great to see and they're going to need to maintain a competitive level,” Leman added. Simcoe will enter the Ontario Baseball Association's 'B' tournament in Halton Hills to end the season. Each time the group takes the field between now and then, said Leman, is done with the provincial tournament in mind. “From this day on that's our preparation,” he said. 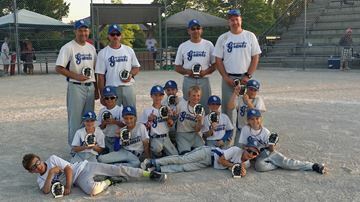 The Giants' win over Chatham registered the second tournament title for the Simcoe Minor Baseball Association this year. The mosquito Giants won an 'A and under' event in London earlier this month. The fields in town will get a break Canada Day weekend but SMBA is set to host a pair of events in July - a major peewee tournament July 7-9 and a joint major/minor mosquito gathering July 21-23. The Simcoe Giants mosquito Tier 1 team captured the London Badgers A-and-under tournament over the weekend. In the final, the Giants had great pitching performances from Andrew Auld and Rowan Kwarciany in an 18-4 win over the Stouffville Yankees. The Giants offence was led by R. Kwarciany, who had three singles and a triple, while Auld hit a single, triple, and home run. They got two-hit games from Ramon Cook, Hayden Kwarciany, Tyson Swayze, and Sullivan Shrubsole. RBIs went to R. Kwarciany with five, Auld with three, Sam Thwaites, Tyson Swayze, Hayden Kwarciany with two, and Sullivan Shrubsole, Carter Black, and Sam Dikdan with one. The Giants kicked off the tournament with a 13-7 win over the Thornhill Reds. They got two-hit games from H. Kwarciany, Black, Dikdan, R. Kwarciany, and Swayze. H. Kwarciany and Jeryn Shortt each had three RBIs, while Thwaites and Dikdan had two each. A single RBI went to Cook, Black, and R. Kwarciany. Next up was an 11-1 win over the Burlington Bulls. Two-hit games for Cook, Shortt, and Adam Swick — who also hit four RBIs — were backed up by three RBIs for Swayze and singles from Cook, Auld, Shortt, and R. Kwarciany. The Giants then faced the Pickering Red Sox and won 12-2. Cook, H. Kwarciany, and Shortt each had two-hit games, while Cook and Dikdan knocked in two runs each. A single RBI went to H. Kwarciany, Swick, Black, Shortt, and R. Kwarciany. The Giants' closest game was a 7-6 victory over the Clarington Orioles. Thwaites led the offence with a four-hit game, while Swick had two hits, including a first-inning home run. Shortt and R. Kwarciany also had two hits. SMBA has 2 OBA Champions for 2016. Minor Mosquito won "B" in Cobourg. August 26-28th weekend, our Minor Bantam team won the ICBA Minor Bantam Tier 2 Championships in Guelph by beating Woodstock by a score of 4-2. This team went undefeated over the weekend to claim the League championship. July 15-18 our Peewee Tier 1 team won another tournament. This time was a "AA" tournament in Niagara Falls. They won in dramatic fashion with a Grand Slam by Riley Cleaver to beat St. Catharines 9-6. The weekend of July 22-24th they played in Cambridge in the Peewee "AAA" World Series, and despite a record of 2 Wins and 1 loss, did not move on to play on Sunday. July 8-10 was another great weekend for SMBA. Our Peewee Tier 1 team went undefeated in our home tournament and won the championship by defeating Stratford 6-2. Congrats to all players and coaches. June 17-19 weekend was a great one for Simcoe Minor Baseball. Saturday Afternoon our Major Mosquito team beat Stratford 18-8 to capture the rescheduled Brantford tournament championship. 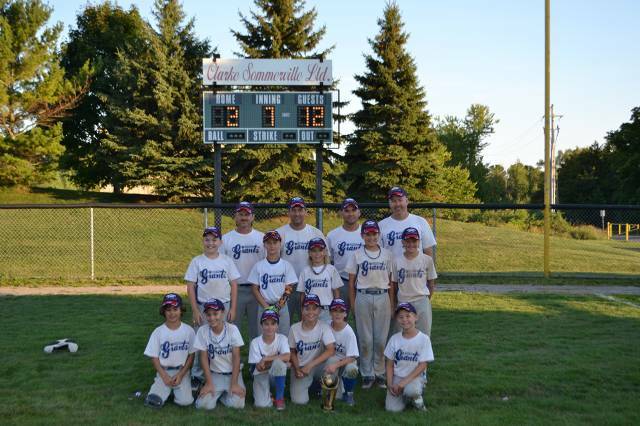 Sunday, our Minor Mosquito team won their home tournament by beating Whitby 16-7. Great job by both teams on their Championships. SMBA's Major and Minor Mosquito teams met the weekend of June 3-5th in the Brantford "B" and under Mosquito tournament semi-finals. The Major team won 9-3 and will play Stratford at a later date for the Championship. Congratulations goes out to all players, coaches, parents and the SMBA assocation. Walking into Lions Park or Memorial Park for a Simcoe Minor Baseball Association tournament, there are a few familiar faces that are always there. Two of those fixtures are Debb Smith and Scott Croswell. They’re the ones with the best seats in the house. Perched directly behind the home plate, the couple from, Simcoe proudly, and very happily, have a watchful eye on the action. Early Sunday afternoon, it happened to be the Simcoe major mosquito Giants and the Tillsonburg Otters. Both with pens in their hands, Smith was taking care of the scorekeeping, while Croswell had all eyes on the pitchers keeping track of their pitch count. About eight weekends worth, since SMBA hosts that many tourneys throughout the summer. For Smith, who has been around ball all her life, it is a labour of love. “I’ve been keeping score since I was 12,” Smith said. “When my dad (Ron Smith) coached, he wanted to know who was where and doing what, so I started keeping score for him. And the couple has been there ever since. “My parents contributed to the community in sports, and it’s something we’d like to do as well, even if we don’t have kids,” smith said. “That’s the way the world works, by giving back. SMBA president Cory Moulton couldn’t be happier to have them around. “Deb goes a long way back. Her dad was an umpire and coach. He actually coached me,” Mouton said. “She’s given up years to the Simcoe Storm as a volunteer. Scott’s been dragged along and he really likes it too. While Smith and Croswell are part of a very small group of volunteers that make these tournaments work, Moulton did say it would be great if others would like to help. “Even if it’s a matter of picking up a rake and helping with the diamonds before or after a game,” Moulton said. “Every little bit helps. 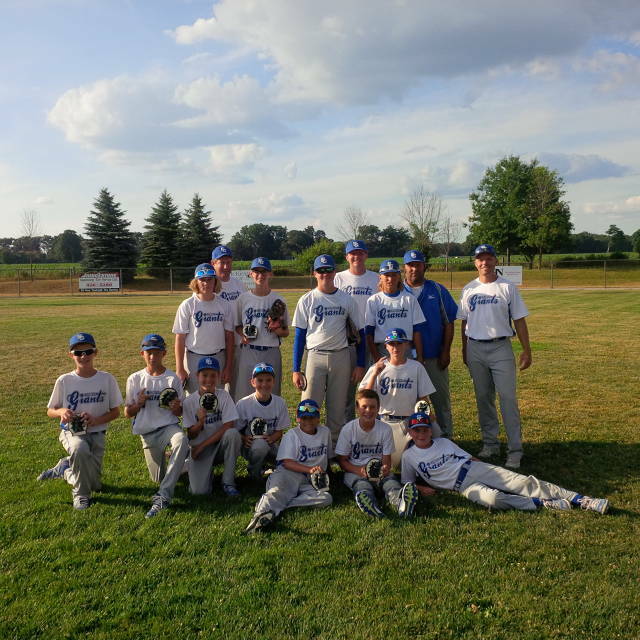 BATTERS BOX: The minor and major mosquito teams had a great weekend, making it on to Sunday. Unfortunately, the Otters caught fire, beating the majors in the quarter-final and then the minors in the semifinal, before winning the title over Kingsville. Though they came up a little short, both Simcoe mosquito teams showed plenty of bite this past weekend. In fact, both Giants entries got through the round robin portion of the Simcoe Minor Baseball Association Major Mosquito Tournament at Lions Park unbeaten before falling to Tillsonburg, the eventual champions. “We fulfilled all of our team goals as far as defensive play and the way the kids are expected to conduct themselves,” he added. The younger Giants did yeoman work in finishing second overall after the round robin, and securing themselves a spot in the 'final four' by beating Halton Hills in Sunday's quarter-final round. The group, said coach Jeff Shortt, didn't have enough left to knock off the eventual champs. “Full credit to (Tillsonburg), they're a really good team. The tank was empty and the age difference definitely showed in that game,” he said. The squad's highlight of the weekend came in a 6-5 nail-biting victory over Halton Hills. “We had played them in the Brantford tournament as well and beat them there,” Shortt noted. As both teams racked up a combined mark of 7-2, Simcoe's coaches pointed to a 'Learn to Pitch' program held during the off-season as a major difference-maker. With pro hurler Brock Dykxhoorn, Matt Martinow of the Hamilton Cardinals and longtime coach/former Giant Greg Zelem leading the way, both squads have developed an arsenal of arms. Putting time in during the weekend were a group of parents and dedicated volunteers making sure everything went off without a hitch. “A big thanks (goes) to all the parents for their hard work throughout the weekend and throughout the year,” Leman said. Simcoe's major mosquitoes will travel to Chatham for the Ontario Baseball Association championship tournament while the minor mosquitoes head east to Cobourg. Both events take place Labour Day weekend. The Simcoe Minor Baseball Association Major Mosquito Tournament couldn't have come at a better time for the local entry. Chad Leman's Giants have not only been growing in leaps and bounds within the ultra-competitive InterCounty Baseball Association (ICBA) but during tournaments there are facing the same opponents they'll see at the Ontario Baseball Association provincial championship. Beginning Friday, the Giants will play host to 12 squads from across the area with one goal in mind. "This tournament is going to be a focal point to catapult us to (the provincial championships)," Leman explained. "We're playing some really good baseball, we've started to win a few games in the ICBA and have a couple ties to go along with that. The kids are playing exceptionally well right now and we're starting to peak at the right time of the year." Simcoe plays at 5 p.m. Friday night before returning to Lions Park for games at 9 a.m. and 2 p.m. on Saturday. Leman's club has one tournament victory this year, finished second in two others and plans on making a statement on home turf. To do so, they'll look to the defensive side. "Our pitching and defence are pretty much bang on," said the coach. "(Their progression has) probably surpassed with a month of baseball left where I thought we would be at the end of the year. That's 1 through 10, that's not just a couple kids, that's everybody. We've had some kids that have never played this style of baseball before really take to it and learn. They've really excelled." The tournament marks the beginning of the season's stretch drive. Not only will the Giants be competing in ICBA playoffs in the coming weeks, but travelling to the OBA 'B' championships in Chatham. Leman and his staff would like nothing more than to bring a title back to Norfolk County when all is said and done. "We've got a great group of kids that love baseball and love to be with each other. We've got a very supportive parent group and the rest of the coaches are fully engaged and are just tremendous with the kids," he said. "It's been a tremendous year so far, we don't want to say it's over, we've still got a lot to go yet. Hopefully all those positives lead to an OBA championship." It’s always a good night when the Simcoe Edge Imaging Giants get to play on its home field at Lions Park. But when it’s a weekend, it’s extra special for Dave Leatherland’s peewee crew. Over this past weekend, the tier 1 Giants showed off their hard work in front of its friends and family, taking the championship of their own tournament. Offensively, the bats were scorching, outscoring its opposition 81-4, which included a 6-2 victory over Stratford in the final. “The bats really did come alive, which is something you always like to see,” Leatherland said. “The nice part was that every player hit the ball hard. That’s what you want to see. That was very evident this weekend. The Giants began the round robin with a 16-4 win over St. Catharines, before blanking Beamsville 12-0 and Burlington 18-0. In the quarter-final, the Giants beat Newmarket 17-2, and blanked Valley East, from Sudbury 12-0 to get into the final against Stratford. With the offence was on full display, the Giants also were able to flash plenty of leather in the field. These are all things the Giants hope to continue as the team moves forward, and into a very busy part of the season. Currently, the Giants sit at 10-8 in the Inter County Baseball Association peewee Tier 1 division, matched up against some of the heavy hitters provincially. They’ve played and beat the London Badgers, last year’s Ontario Baseball Association AAA champions, and hosts of this year’s national championship at that level. The Giants will now head to Niagara Falls this weekend for a AA tournament, followed by the Cambridge Minor Baseball World Series AAA tournament the weekend after. Leatherland hopes those tournaments will prepare them for the OBA championships Labour Day weekend. The Simcoe peewee Giants aren't exactly gracious hosts. In fact, the group may have trouble finding opposing teams willing to come to Lions Park next season. That's because this past weekend coach Dave Leatherland's crew went a sparkling 6-0 to claim the SMBA Peewee 'A' Rep Tournament for the third straight year. “All the families and the kids look forward to having a home tournament,” Leatherland said of the 12-team event. On Friday evening the Giants downed St. Catharines before returning to the field to defeat Beamsville and Burlington on Saturday. As the No. 1 seed in their pool, the Giants topped Newmarket and Valley East (Sudbury) to earn a date with Stratford in the final. The home side finished strong with a 6-2 win. “The kids got on a roll, played extremely well and had some fun at home,” Leatherland explained. The Giants currently sit third in the InterCounty Baseball Association Peewee Tier I division with a record of 11 wins and 8 losses. Leatherland said his team's most recent triumph is a nice boost headed toward their busiest stretch of the calendar. It all concludes at the end of the summer with the Ontario Baseball Association provincial tournament. The Simcoe Rookie Giants were eliminated from their hometown tournament Sunday morning after the Royal York Cardinals scored with two out in bottom of the last inning. The match ended in a score of 8-7 in what can be described as a tight well-played baseball game. The game could have gone either way and featured some fine defence by the Giants, who threw a couple of runners out at the plate. Even though his team didn't win, coach Mike Winnie said he was pleased with what he saw. 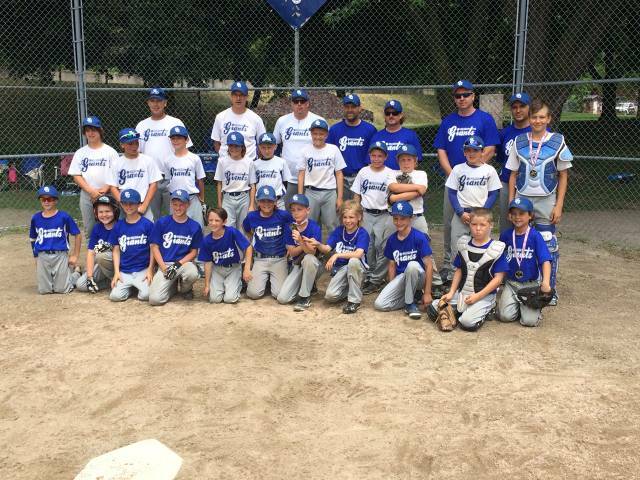 Simcoe hosted a rookie (kids aged 7-9) rep tournament for the third year in a row at Lions Park on the weekend. Twelve teams took part over three days of games. In the round-robin, the Giants won once and lost twice. They still managed to qualify for the playoffs and had to go up against the top-seeded Royal York squad, which is from Etobicoke. Winnie pointed out that his team is young and had only three returnees from last year. 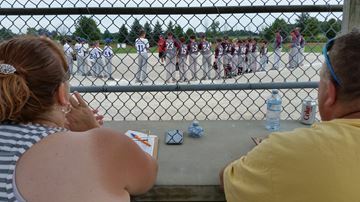 The rookie tournament was one of several Simcoe Minor Baseball Association hosts every year. The goal, ball officials have said, is to give every kid in Simcoe minor ball, whether they play on a rep or local team, a home tournament to play in. On the weekend, teams travelled from Waterloo, Ingersoll, Milton, Kitchener, Waterdown, Beamsville, and London to play. Many of them stayed the night in local motels. Simcoe will host a peewee rep tournament in two weeks time and the Midget Ontario Baseball Association final on the last weekend of August. Minor ball sold tickets for two framed collages of Toronto Blue Jays players in action as drawn and painted by artist Chris Ripley. Proceeds went to minor ball. The Simcoe Minor Baseball Association was right all along. For nearly the entire off-season, SMBA executives and coaches wondered about possibly housing a pair of mosquito rep teams in 2016 for the first time ever. In the end, they did just that. It was all justified on Sunday. 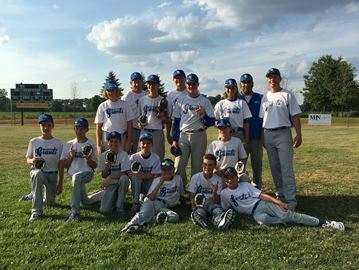 At Lions Park in Simcoe, Jeff Shortt's minor mosquito squad captured their home tournament – the first in organization history – while coach Chad Leman and his major mosquito Giants topped all comers at a tournament in Brantford. Shortt's squad outscored opponents 76-30 in six games to emerge as the best of the 12 teams that visited Norfolk County. The Giants nearly stumbled in the quarter-final against Waterloo after getting down 5-4 in the sixth. Fireballer Adam Swick struck out nine of 12 batters down the stretch and the home side rallied with two runs in the bottom half to register a 6-5 win. Simcoe went on to top both North London (11-5) and Whitby (16-7) for all the Tostitos. The first-year Giants currently own a record of three wins, six losses, and two ties in Tier I of the ultra-competitive InterCounty Baseball Association (ICBA). The division includes teams like Cambridge and Brantford. “We're actually very excited because you just never know if you'll even win a game in that league because you're playing triple-A and double-A teams,” Shortt explained, adding the roster has already achieved one of its major goals set for the 2016 campaign. Things weren't quite as dramatic for the major mosquito Giants in Brantford. Simcoe won four of their five games via the mercy rule, including an 18-8 victory over Stratford in the final. It was a great change of pace for a team that's found wins hard to come by in their ICBA loop. “All the heartache and lumps that we've taken are paying off and we're turning ourselves into a really good team,” Leman explained. Like the younger mosquito Giants, Leman's squad has played a hectic schedule as of late. It was all by design. Regardless of how both teams finish in the ICBA standings, it appears as though the future of Simcoe's program is in great hands. “Hopefully, this kind of success pays forward for the ICBA for years to come,” Leman said. The mosquitoes in Simcoe aren’t only pesky, but walloping a big punch nowadays. 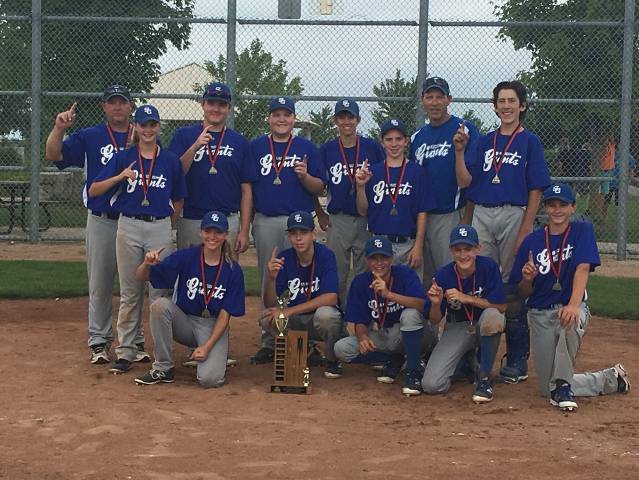 Over the weekend, the Simcoe Giants minor and major mosquito teams continued to impress, with both teams capturing the championship at their respective tournaments. At Lions Park, the minor mosquito squad was virtually untouchable, winning six-in-a-row to capture the Simcoe Minor Baseball Association Minor Mosquito Tournament. 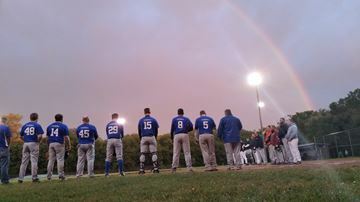 The minor Giants kicked the tournament off Friday with a 13-3 win over Waterloo. On Saturday, the Giants continued to roll along, hammering Thornhill 20-7 and Whitby 10-3. With a ton of confidence, the Giants persevered in the quarter-final, with a 6-5 win over Waterloo. On Sunday, the Giants regained their form, beating North London 11-5 in the semifinal. A couple of hours later, the Giants won the championship with a 16-7 win over Whitby. Shortt said he and his coaching staff couldn’t be more proud of their team, especially since each kid contributed. Offensively, every player earned a hit. But what may have separated the Giants was its pitching. They threw eight of its 12 players on the on the mound, and every one put in a solid effort. Shortt credits the learn to pitch program SMBA held in the offseason. He also credited the major mosquito team for blazing the trail of success for them. While the minor team won at home, the major Giants finally got a chance to complete a tournament in Brantford, with an 18-8 win over Stratford in the final. The tournament, which took place two weeks ago but the final was washed out because of a storm that rolled in. The major Giants flexed its muscles during that tournament, beating Milton 11-1, Welland 13-3, and Ottawa 12-1 in round robin action. In the semifinal, they took on the minor Giants and beat them 9-3. That semifinal game was not only competitive, it showed off the unity the two teams have, when they posed for a team photo all together. 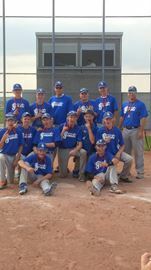 The Simcoe Giants midget baseball team rode the learning curve in their hometown tournament on the weekend. They were introduced to some higher level pitching in the three games they played, two of which were against top-tier teams from London and Burlington. The Giants team is made up of mainly first-year midgets while many of the other centres in the tournament were third-year teams. They were bigger and stronger and threw the ball harder and with more movement than what Simcoe normally sees in its Inter-County regular season play. The Giants won one game and lost two and were eliminated from the playoff round in the tournament, which was played at Memorial Park. They dumped the Walsingham Senators 10-4 in their first game, got smacked 10-0 by the Burlington Bulls on Saturday afternoon, and then lost 6-2 to London, which ended as runners-up in the tournament. Moulton said his team is trying to improve its hitting. The tournament was won by the Hamilton Cardinals, which defeated London 5-4 in 11 innings. Six teams were entered but more could have been added if the organization had access to another diamond, said tournament convener Jeremy Shortt. “I had to turn away a lot of teams. We need another diamond in Simcoe to be honest,” he said. The weekend tournament is one of 12 the SMBA will host this year, one for every child at every level of play including house league. The SMBA continues to grow. Registration this year sits at about 400 – 100 more than last year. The upsurge in interest is directly related to the success of the Toronto Blue Jays, said Moulton. The more they win, the more kids sign up to play. In the early 1990s, when the Jays won two World Series, registration reached 500. It dropped as the Jays fortunes dwindled and is now back up again. The organization is so busy it now uses the Cedar Street and Lions Park diamonds for its younger teams in addition to Memorial Park, the only true hardball diamond in Simcoe. Simcoe's Memorial Park played host to the present and future of the Intercounty Baseball Association’s midget division on Saturday. The friendly confines welcomed a doubleheader featuring the Tier II league's top-ranked club from Listowel and a young Simcoe Giants squad looking to establish its identity. Though Simcoe would show flashes of brilliance, highlighted by a four-run first inning to begin Game 1, the visiting Legionnaires came away with a pair of victories, 11-6 and 5-0. Both contests were close at various points but the Legionnaires experience shone through when it counted most. The visiting roster consisted of just a couple players in their first midget campaign (16 years old) while Simcoe has just a pair of third-year veterans in outfielder Tyler Takacs and catcher Colin Ward. “They're professional guys over there and we're a young group over here. We've just got to push through, keep our heads up and stay positive,” said Takacs. Game 1 saw Austin Moulton draw a first-inning walk before Joel Coderre, birthday boy Nathan Wardell, Robert Ratcliffe and Sherman each registered hits to give Simcoe a 4-0 advantage. Listowel would score six in the third and another three in the fourth to improve their season mark to seven wins and just one loss. The second game saw a pitcher's duel decided by the first three batters of the contest – all scored by Listowel. Simcoe's best opportunity came in the fourth when they put the first two men on but failed to bring anyone across the plate. Losses aside, the Giants were pleased to stick with the loop's best outfit. “We haven't been hitting too good this year but the bats were coming through today and that's positive,” Takacs said. Staying productive at the plate is something Simcoe is looking to build upon for the rest of the summer. Now with a record of 1-4, Simcoe may not finish atop the league standings this year, but Sherman sees a strong future for the club provided they stick together. Simcoe will take on Woodstock at home June 6. First pitch is set for 6 p.m. The Simcoe Giants minor bantams didn’t go into this weekend’s baseball tournament in Simcoe with any ideas of winning. Instead, it was an opportunity to check out the calibre of play in surrounding centres and learn from it. The Simcoe Minor Baseball Association has staged this tournament for the past three years. It does so, in part, because baseball tournaments for the 13-to-15 age bracket are relatively hard to come by. The Giants minor bantams participated in a tournament two weeks ago where they made it to the semi-finals. That wasn’t going to happen in Simcoe this weekend. The Giants are a minor bantam squad, meaning their players are 13 going on 14. They were up against nine visiting teams from urban centres whose players are 14 going on 15. Simcoe lost the three games it played. The eventual champions from Ancaster defeated the Giants Friday by a score of 8-2. The Erindale Lions of west Toronto defeated Simcoe 14-0 on Saturday while the Pickering Red Sox’s No. 2 squad beat the Giants 5-1 in the final game of the day. The tournament was played at Memorial Park in Simcoe, with games Friday and Saturday also played at the ball park in Delhi. Other clubs in the competition included the Pickering Red Sox No. 1 squad, the Barrie Red Sox, the Guelph Royals, the Burlington Bulls, the Toronto Playgrounds and the St. Thomas Cardinals. The Simcoe Giants Bantam Tournament is a big hit with out-of-town clubs and their associated parents. Shortt said the 10 positions available filled up fast, with about half a dozen teams waiting in the wings. Visiting families treat the tournament as a getaway from the city. They have a number of favourite stores in the area that they like to visit. They also admire the old-school charm of Memorial Park, which is nestled in a mature green space that features frequent sightings of wildlife. The highlight of the tournament was Sunday’s semi-final featuring Barrie against Erindale. Games normally go seven innings. However, this one went 10 before Barrie prevailed 7-6. Whether that was a factor in the eventual outcome is hard to say. Barrie had to play the Ancaster Diamondbacks for all the marbles immediately afterward. The Diamondbacks made the most of their chances en route to a 15-5 win. There was certainly a different feel to things at Memorial Park on Sunday night. 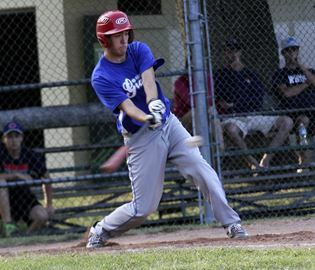 With the Simcoe Demeyere Giants taking to the field in its season opener against the new team from Scotland, the second season for the Southern Counties Senior Men’s Baseball League was about to begin. Last season, the Giants, Port Dover, Delhi and Walsingham rounded out a fledgling four-team loop, bringing back senior baseball back in the area after a long absence. Over the offseason, interest has grown, and so has the league. Scotland and the Walsingham Oldtimers have joined the league, with everyone playing a 20-game schedule. “The response has been pretty overwhelming,” Shortt said. “Looks like we will have a huge roster of 22 guys. We didn't want to make cuts, because we want to give everyone a chance to play senior baseball. “I wouldn't be surprised if the league expands to at least nine from this year's six teams, including another team in Simcoe if someone wanted to run it, the interest is there,” he said. The Oldtimers are one of those teams ready to go. They lost 7-2 to Port Dover on Saturday, while the defending champion, Walsingham Seniors beat Delhi 6-3 Friday. Jamie Clark, who is one of the people heading up Scotland Best Weigh Scale, couldn’t be happier to be part of the loop. With the 20-game schedule, there will also be a trophy on the line for the winner. But that’s not the only thing teams are aiming at. With spots available for Southern Counties teams at the Ontario Baseball Association championships on Labour Day weekend, teams are playing a front-loaded schedule, with the top-two teams at the end of 10 games earning those berths. The Giants opened its season with a 14-12 win over Scotland. Shortt was happy to get everyone in the game. But with a large roster, his job has become a juggling act. On Thursday the Giants travel to Walsingham to take on the Seniors, while the Oldtimers play in Delhi Friday, and Scotland is in Port Dover Saturday. The next week, the teams go to Walsingham to play in the three-game tournament-style weekend as part of the front-end heavy schedule. There's something magical about baseball teams taking the field for the first time. It's a sight Cory Moulton looks forward to like few else. The organization's schedule for 2016 includes hosting seven rep level and five house league tournaments as well as the Ontario Baseball Association's midget 'B' championship Aug. 26-28. “(Tournaments are) big for the town too because motels are full and restaurants all benefit,” Moulton noted. SMBA will hold its first registration date Feb. 27 from 10 a.m. to 1 p.m. at the Simcoe Rec Centre. The gathering is the latest of several SMBA events hosted throughout the off-season. “We did a bunch of different stuff over the winter,” Moulton said. In a little more than a month's time, the organization's popular spring workout sessions will commence. The first is set for April 5 and is open to anyone born between the years of 2003 and 2012. This season requires three separate age categories. It could be argued baseball hasn't been this popular in Canada since the early `90s, thanks in large part to the Toronto Blue Jays run to Game 6 of the American League Championship Series last fall. Moulton said that unforgettable Jays run could be a boon for minor organizations like Simcoe. Dave Scott from the Norfolk Hub put an article in the Norfolk Hub about SMBA. Check out page 5 from the link above. The Simcoe Demeyere Dodge Chrysler Giants take a moment to pay tribute to their sponsors, Doug and Starr Demeyere, who were recently killed in a tragic fire in New Brunswick. Doug and Starr Demeyere were certainly smiling down on the Simcoe Giants team that wears their name on their backs. A week after the local couple were found dead, when a fire ripped through the New Brunswick home they were staying in, the Demeyere Dodge Chrysler Giants paid tribute to them at Memorial Park Sunday. On the strength of a no-hit performance on the mound from Jamie Adams, and a very potent offence, the Giants pounded a 10-0, five-inning win over the Delhi Tigers. The win gives the Giants a 1-0 lead in their Southern Counties Baseball Association senior men’s semifinal series. While the victory was big because of the playoff implications, that was certainly not the focal point, as the team paid tribute to their sponsors at the beginning of the game, as a rainbow formed thanks to the rain across the entire outfield. “It was an emotional night for me obviously,” Shortt said. “The fact that we honored good friends that I've worked for, the last 18 years and having the first playoff game in the southern counties men's league in 14 years, which is when I last played. On the fields, Adams’ command was fantastic, despite the rain, sometimes coming down heavily. After a slow start in the first two innings, the Giants bats got rolling. Shortt said the offence is something that has come a long way since the beginning of the season because many of the players haven’t played competitive baseball in years. Game 2 of the best-of-five series was in Delhi on Tuesday at 7:30 p.m.
Game 3 is back at Memorial Park Thursday, at 7:30 p.m., with Game 4, if necessary, Friday in Delhi. Heading into the provincial championships this weekend, the Simcoe Pita Pit Giants are riding a huge wave of momentum. That’s exactly what the bantam baseball team was hoping for. And winning the InterCounty Baseball Association championship is an even larger bonus. After going undefeated throughout the tournament, the Giants were given double life in the final against the London Badgers. Which the Giants took full advantage of. Despite a rough 7-2 loss, the Giants Game 5 rode the pitching of Cole Robinson, while Ben Sherman and Mitchell Barker were the offensive catalysts in a 8-4 victory to clinch the title. “Going in, coach Greg (Zelem) always says to play for the person beside you and that’s just what we did this weekend,” Schmitt said. In 6.2 innings of work, Robinson had four strikeouts, one walk and gave up five hits. “Mitchell and Ben were key elements on the base paths,” coach Zelem said. “Both went 2-for-2 with two singles. Plus Sherman walked once and scored one run and Barker scored twice. The Giants kicked the weekend off with a 5-3 win over the Stratford Indians. SHerman got the win on the mound, giving up three hits, while striking out four and walking four in six innings of work. Devin Defreyne went 1-for-1 and had a pair of runs batted in. Alex Fishback then had a strong pitching performance, allowing no hits and striking out six in a 4-2 win over the Brantford Red Sox. Offensively, Robinson led the way, going 2-for-2 and scoring twice. The victor set up a date with the second-place Kitchener Panthers in the undefeated game to earn a berth to the final with double life. The Giants won that game 9-7. The pitcher combination of Devin and Ty Wall helped attain and hold the lead, while the rest of the team helped chip away offensively. Ethan Smith had a clutch double in the 10th inning to help clinch the win. As of late, the Simcoe Picards Giants have hit their stride and coach Tim Dedrick was hoping for more of the same when his team hosted the Ontario Baseball Association midget B championships over the weekend. Fortunately, the bats were there to maybe do it. Unfortunately, the defence wasn’t. Case in point, the Giants’ 7-4 loss to the Northumberland Jacks in the semifinal on Sunday. After the Giants got up 2-0 early, despite leaving the bases loaded in the first and third innings, but couldn’t add to the lead, the Jacks chipped away at the lead. Some bad breaks cost the Giants, leading to the defeat. After defeating the Giants, the Jacks couldn’t get by the Essex Yellow Jackets, who won the Ontario title with a 6-2 win. The Giants also had a shot at the Yellow Jackets early on Saturday after coming away with a 9-3 win in their opener. Like they did in the semifinal, the Giants showed they belonged, and were in the hunt for an OBA title. But again defensive lapses snowballed and the Yellow Jackets earned a 7-4 win. “We left guys on base but got a lead early,” Dedrick said. “We were in control until the fifth inning. Before you know it, they got up on us and we couldn’t recover. When things like that happen, you wish you were able to turn it around. Sometimes you can’t. “That was the tough one,” Dedrick said. “It was a pivotal game because of the double-knockout format. We just couldn’t hang on. After the loss to the Yellow Jackets, the Giants did rebound with a great effort in a 6-2 win over the Bolton Braves. Dedrick said that has been key for success the entire season, including a semifinal appearance in the InterCounty Baseball Association championships the weekend before. But now the season is over for the Giants, with many hoping to move on to junior next season. It was about as perfect a season as you can get for the Simcoe Townsend Mutual Giants. 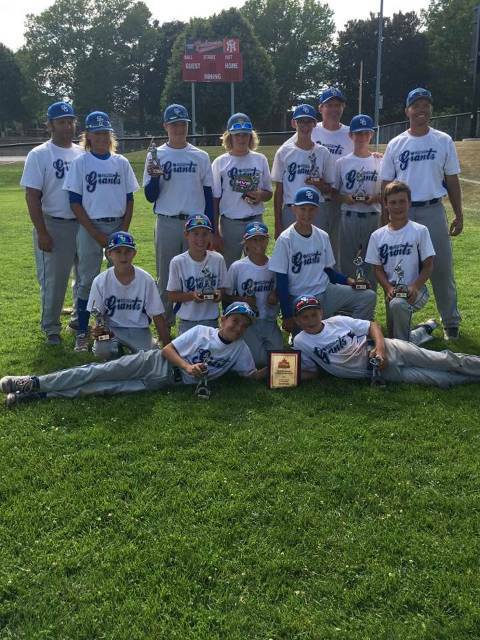 The Giants showed just how mighty they are this weekend, completing an undefeated season, by winning four more games convincingly to capture the Southern Counties Baseball Association rookie championship in Port Dover. And that was very evident in the way they won the title. In the final, the Giants bats were hot, with nearly every player getting a hit in a 11-7 win over Ingersoll. Timothy Eastman, O’Brien, Shortt and Auld all had two runs batted in, while Tyson Swayze had one. In the semifinal, Auld’s bat was scorching, hitting three doubles, a triple and knocking in six runs, while O’Brien had two singles, a double and three RBI in a 18-0 route over Port Dover. The Giants began the tournament Saturday, with a 14-6 victory over Ingersoll. While Kwarciany had four singles, Shortt had two that knocked in four runs. Timothy Eastman and Auld each had three RBI, with Auld and Sam Thwaites stroking homeruns. In the Giants’ second game Saturday, every Giants player got a hit in a 22-2 win over Port Dover. Although coach Shortt said the team leaned on the more experienced players, he said the first-year members of the team grew all season and played huge roles on the team. “Timothy Eastman and Logan Snyder are first year players and have been improving all year long,” short said. “They both still have another year of rookie ball next year and will be the leaders of next years team, along with Mike Winnie who was away on vacation and missed this weekend's tournament. Tyson Swayze and Sam Thwaites are both players in their last year of rookie ball and made the jump from house league last year. Tyson and Sam are our outfield leaders. They continue to amaze with their outfield play. “It really has been a rewarding season,” he said. “It’s a great group of kids. 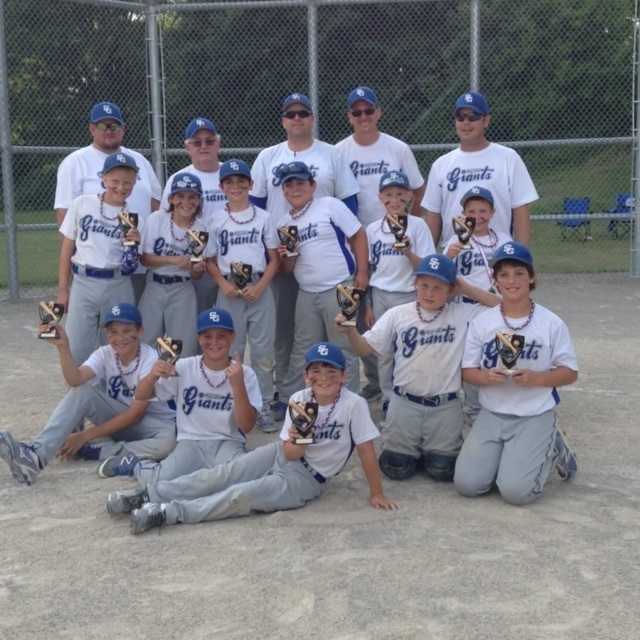 The Simcoe peewee Tier I Giants didn't just win their home tournament on the weekend. They swept it. The Giants went 5-0 over three days at the Lions Park, and none of the games were even close. In round-robin action, they won 17-0, 10-0, and 15-1. They dumped the Brantford Red Sox 16-1 in the semifinal and then defeated a tough St. Thomas Cardinals squad 9-2 in the championship game. Going into the seventh inning of the St. Thomas game, Simcoe led 9-0 and up to that point had only let in two runs the whole weekend. How can this team be so dominant? “We play AA and AAA teams (teams from larger cities) during the regular season. That's what helps us develop our players,” said coach Dave Leatherland. On the weekend, the Giants, whose regular opposition includes the best teams from London, Guelph, and Kitchener, showed poise as well as strong defence and pitching. In the first inning of the championship game, the Giants capitalized on a couple of St. Thomas errors, went up five runs, and then shut the door defensively. The tournament was a combined mosquito-peewee tournament that brought in a total of 20 teams, including Simcoe's Tier II peewee squad. That team went 1-2 in round-robin play and never made it to the playoffs. But they had a good game against St. Thomas even though they lost, said coach Jeremy Shortt. 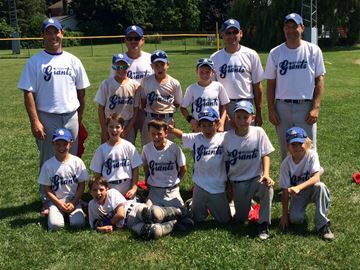 The Simcoe mosquito Giants made it to the semifinal where they lost to the Guelph Royals 9-3. The mosquitoes won all three games in the round-robin before defeating Stouffville 11-2 in the semifinal. That team also plays in a Tier I league and regularly faces tough competition. 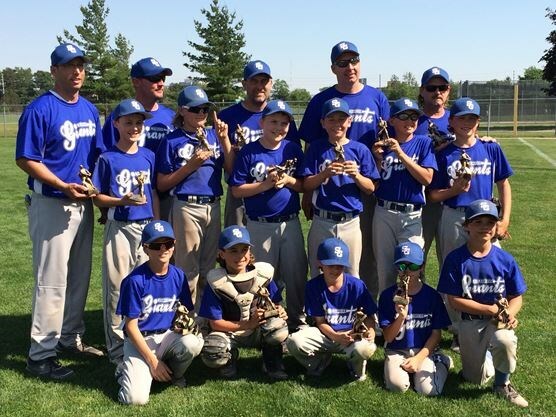 The weekend marked another successful tournament for the Simcoe Minor Baseball Association. It now hosts five tournaments a year – one for each level of play – and will host the midget Ontario Baseball Association playoffs the last weekend of August. The tournaments continue to grow in popularity, said SMBA officials, and on the weekend the diamonds at Stalker Park on Cedar Street were used for mosquito games. Visiting teams had praise for SMBA. Peewee baseball teams from rural towns just aren't supposed to compete with boys from big cities like London, Kitchener and Guelph. Unless that team hails from Norfolk County. As has been the case in past years, the Simcoe Giants are once again a competitive outfit within the Inter County Baseball Association (ICBA). The blue and white are a top three squad inside the league's Peewee Tier I standings, despite that fact they have just three returning players. The rest are experiencing the level for the first time, and winning along the way, compiling an 8-6 record facing rosters with all second year competitors. There are a few theories as to why the Giants have been successful. The first stems from chemistry and execution. “We work as a team very well and we don't make a lot of mistakes,” said Zack Van Netten, left fielder and first baseman. The second thought towards Simcoe's success is that a large portion of the roster compete alongside one another in minor hockey. The core has even captured OMHA and league titles together. Ultimately, the Giants know that a hot start won't always equal success in the quest for a provincial title. They're keeping a few things in mind as the Ontario Baseball Association 'A' tournament in Burlington on Labour Day weekend approaches. If the team is to continue its winning ways, they'll need to do so on the road. After Saturday's double dip vs. Guelph, just one of their remaining nine regular season dates will be played in the friendly confines of Lion's Park. That's good news for the Giants – they're 4-1 on the road this year with the only loss coming versus first place Kitchener on June 20. “We need to hit the ball good, have smart baserunning and we need to get it done,” said centre fielder Adam Leatherland. Simcoe's next home game comes on Aug. 10 at 6 p.m. against Kitchener. Simcoe Minor Baseball has never been a group to back down from a challenge. Its mosquito rep team is following suit. Wins have been scarce for the Giants within the ultra-competitive Inter County Baseball Association league this year, but coming out top isn't the team's sole focus. “We're trying to develop – a lot of our players haven't been exposed to this level of ball so we're trying to get them to a level of comfort when they are out there. They're trying hard and you can't fault them for that,” said Giants head coach Chad Leman. At the mosquito level, rookies are exposed to live pitching for the first time. For Simcoe, they're facing teams comprised of completely second year veterans from centres like Kitchener, Guelph and Brantford. “Playing against better kids always makes you better – it's the lumps along the way they're going to have to be mentally tough to endure the rest of the year,” Leman said prior to his team's contest versus Kitchener June 30 at Lion's Park. Realistically, the squad stands a strong chance when facing teams from similar drawing areas in the provincial tournament on Labour Day. Two of the team's second year players aren't getting down with a lack of wins. Starting pitcher Alex Auld and No. 3 hitter Ryan VanNetten have made a point of building up their teammates during the tough times. “We just try and say, 'stay into it, don't give up, keep swinging hard',” said Auld. VanNetten agreed consistency will be key going forward. “We've got to focus on hitting the ball and making all the make able plays,” he said. The outcome for the club in a recent tournament in Chatham seemed positive. After winning their first outing, heavy rain forced the cancellation of an event Auld said his team had a strong chance of winning. Despite that bad luck, the two team leaders are using verbiage handed down by the coaching staff, then doing their best to execute between the lines. The result, said Leman, would be a competitive core for years to come.